Several people who have read my book, “Memories of a Mad Man,” have given me what I consider a supreme compliment—they said that while they were reading it they felt like I was sitting in the room talking to them.That comment/compliment had its genesis over forty years ago when I was a junior copywriter in a Madison Avenue ad agency. To break into advertising any way I could I had taken a job in the mailroom, my bachelor’s and master’s degrees be damned. (Neither of them had anything to do with advertising. )The agency’s creative director was on my mail delivery route and one day I got very brave.Along with his ordinary mail, I dropped in his inbox a piece I had written for the night school copywriting course I had just taken. When he called me up to his office I was terrified. But he surprised me by saying he thought I might just have the makings of a copywriter.And a few days later I was sitting in an office overlooking Madison Avenue as a brand new junior copywriter. My first assignment was to write a radio commercial for our client Redbook Magazine that would entice listeners into buying the next issue.This was during the Kennedy years and in an advance copy of the next issue I found an article on Caroline Kennedy’s life in the White House.I sat down at my typewriter (remember those things?) and painfully wrote and rewrote and re-rewrote the 60-second commercial. When I got up the courage to show it to my boss, he scowled.It was bo-o-o-oring. As he handed it back to me to try again, he said something that changed my life. "Write conversationally…as if you’re talking to them, not writing to them.” And he meant it for all my advertising writing, not just for commercials. I went back to my office armed with a whole new way of thinking about writing and I gradually discovered that the words flowed more easily. My new radio commercial made it through him and onto the radio. I began applying his “write-conversationally” advice to everything I wrote and it worked." Writing was easier and people tended to like what they read or heard. I attribute much of my success in advertising — and now hopefully in book authorship — to those two words. 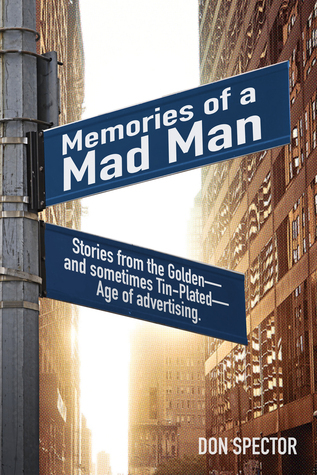 Memories of a Mad Man: Stories from the Golden, sometimes Tin-plated age of advertising by Don Spencer was released on January 10, 2016 independently through Createspace publishing. Disclaimer: This guest post was received by the author or the authors agent or publisher - the opinions expressed within this post are the authors and do not always match those of the blog owner. This post is not an endorsement of the book or product but to provide others information.